So I started this project probably over a month ago so I will need to fill you all in on what's been going on. 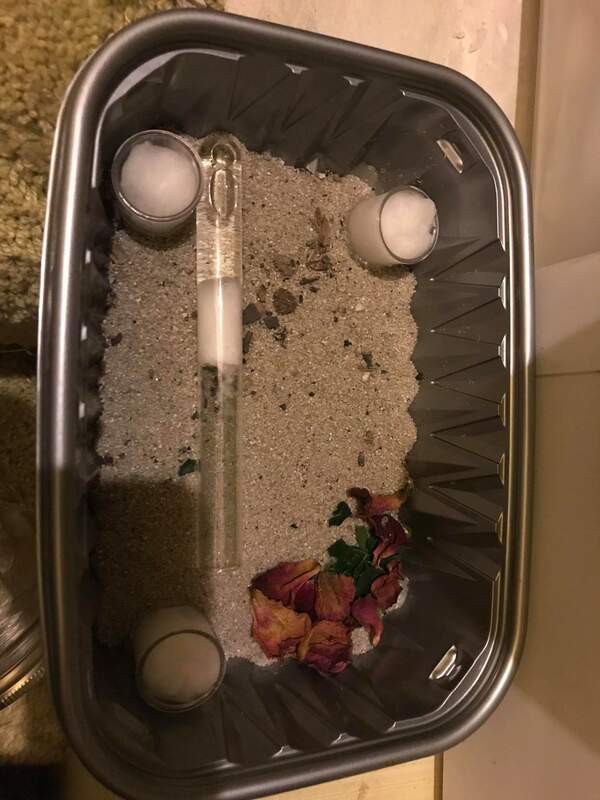 Instead of doing it as one massive dump I will make different posts like a normal journal would and just go on from there. 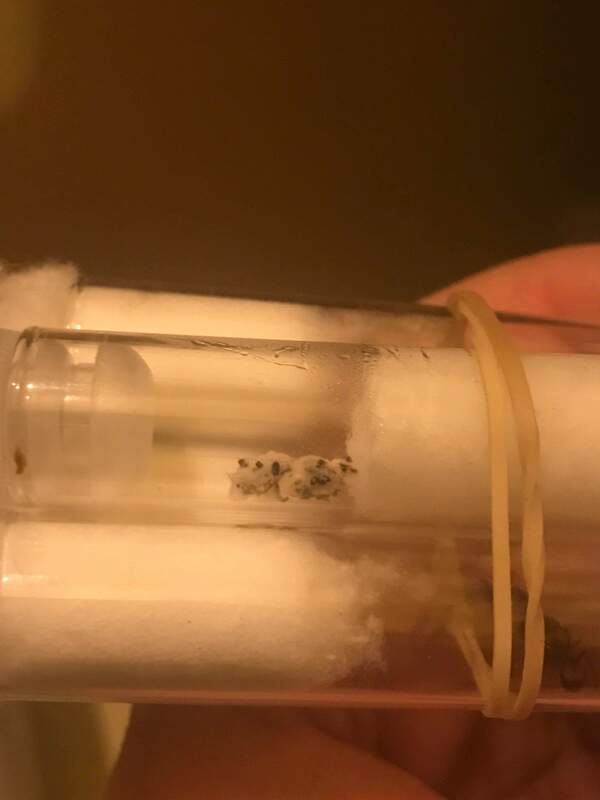 After a week, two of the Queens died and all that remained was my very first Queen, no brood no fungus. 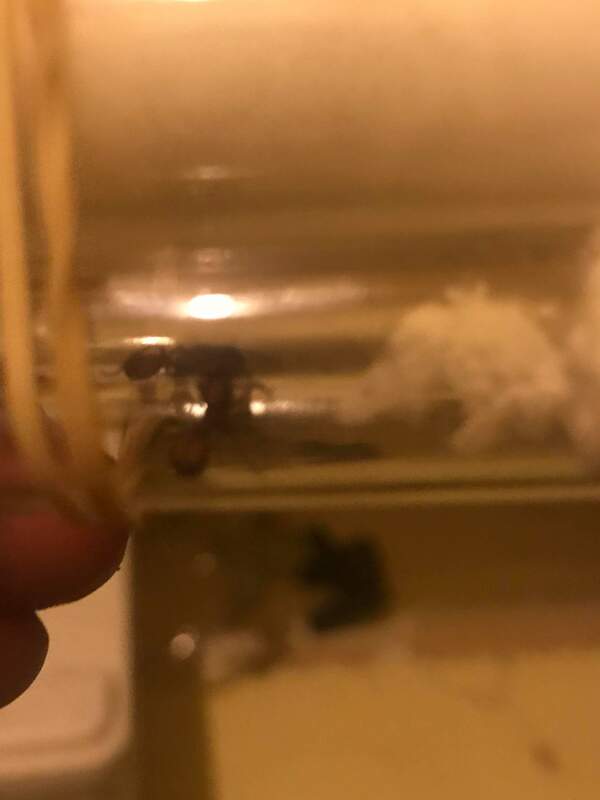 But luckily for me the GAN farmer in my city sold me three more Queens and two pea size balls of fungus for 30$. The farmer is actually someone mentioned in the AC videos esspecialy the videos about the leaf cutters and the Honeypot ants, we live in the same city. 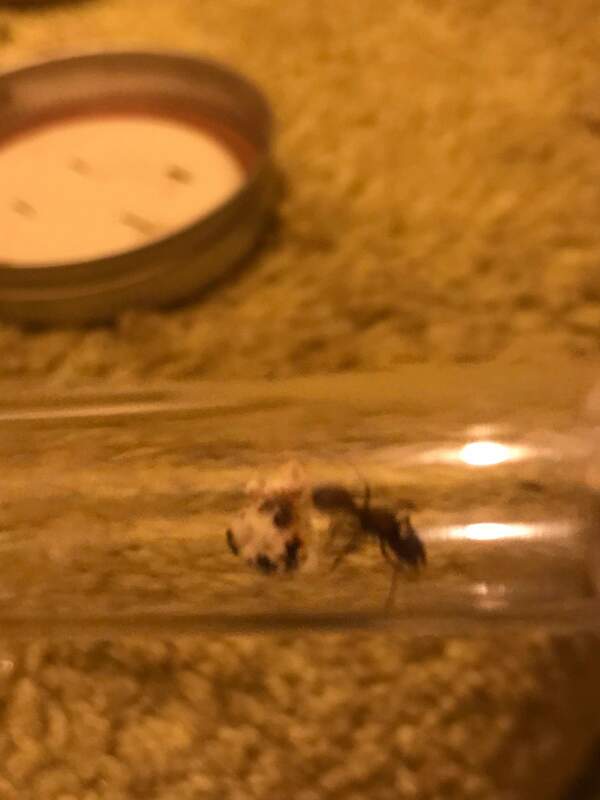 So here I will show you all the Queens and what started happening next. 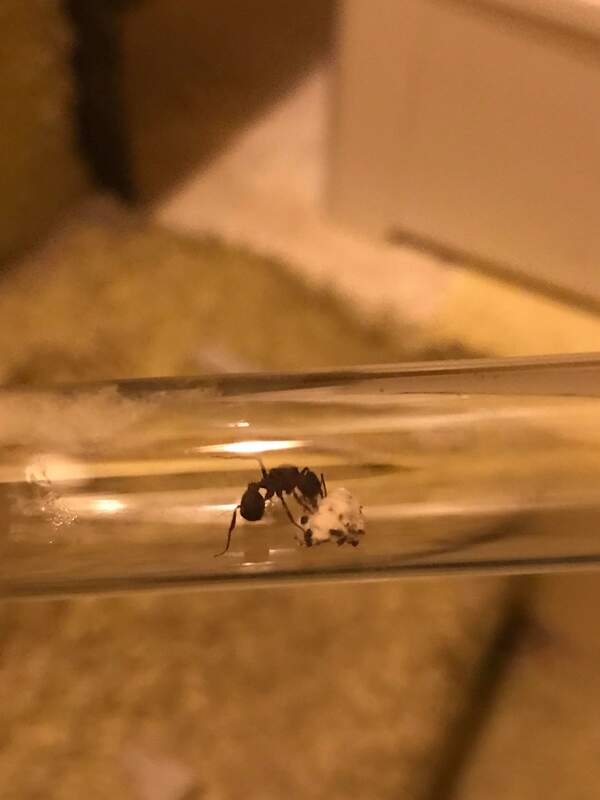 This queen was very excited about her fungus and ran for it. As you can see in this picture she is standing guard over it. To this day she still does this every time I come around with my light and phone to take pictures. Very protective. 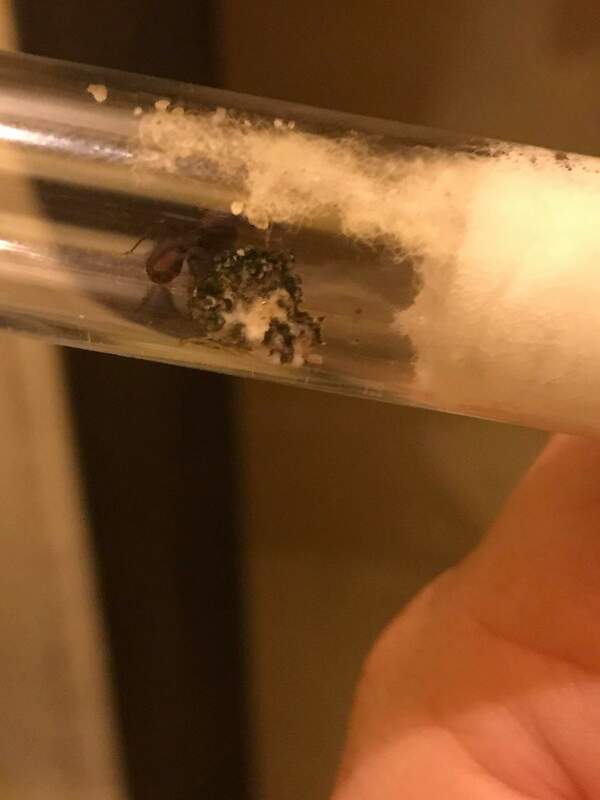 This queen started taking bites out of the fungus and moving the bits closer to the water logged cotton of her test tube. The set up! Small Tupperware containers I got at the 99 cent store. 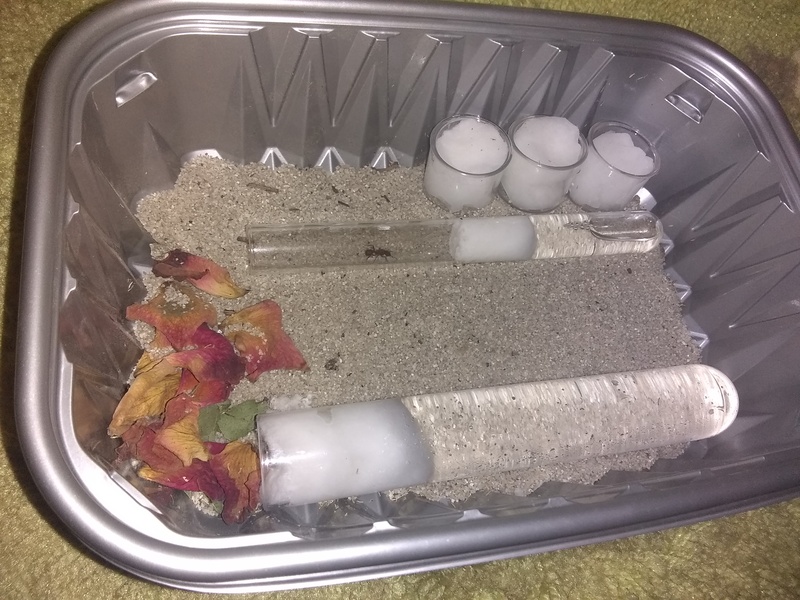 Some white sand, and rose leaf and petals I got from my grandmother's rose bushes. The snap caps are filled with liquid and cotton balls for humidity. Don't worry I add more stuff for humidity later. 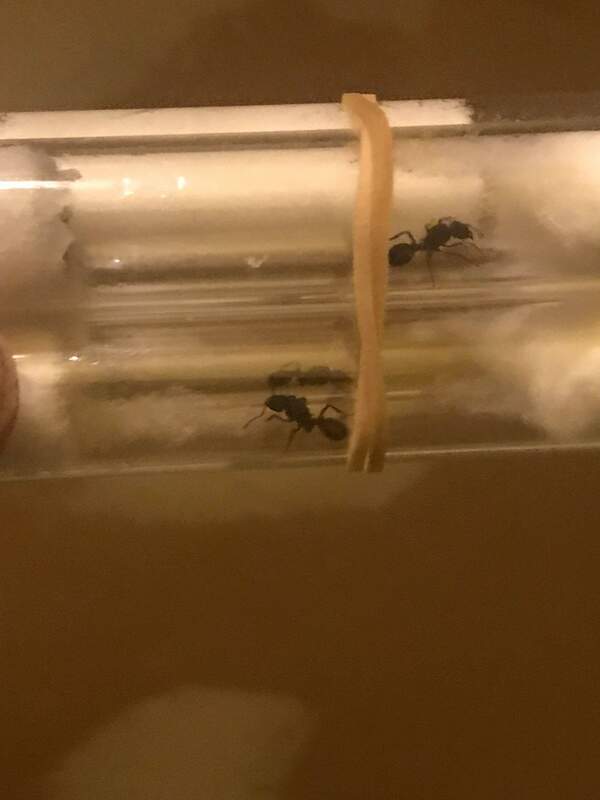 Part three we will meet the queens and how they were doing about two weeks ago. 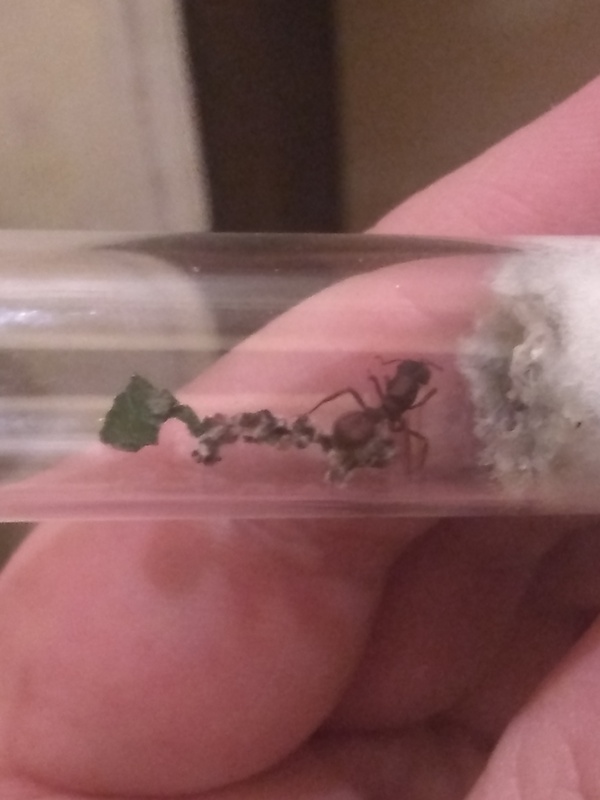 This queen is one of the three I bought but was never given fungus. Not much to say here. 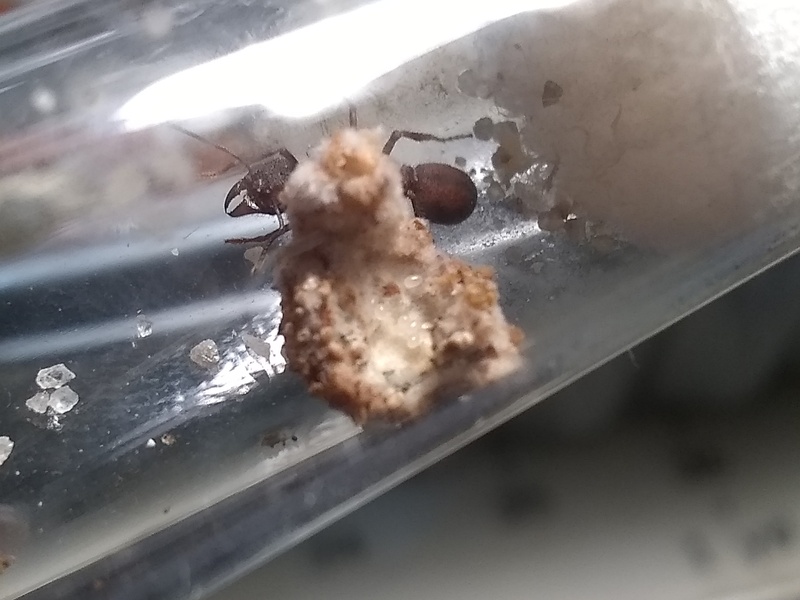 This is that very protective Queens and her fungus. As you can see there is some black on it where she was adding leaf and rose petals to it. 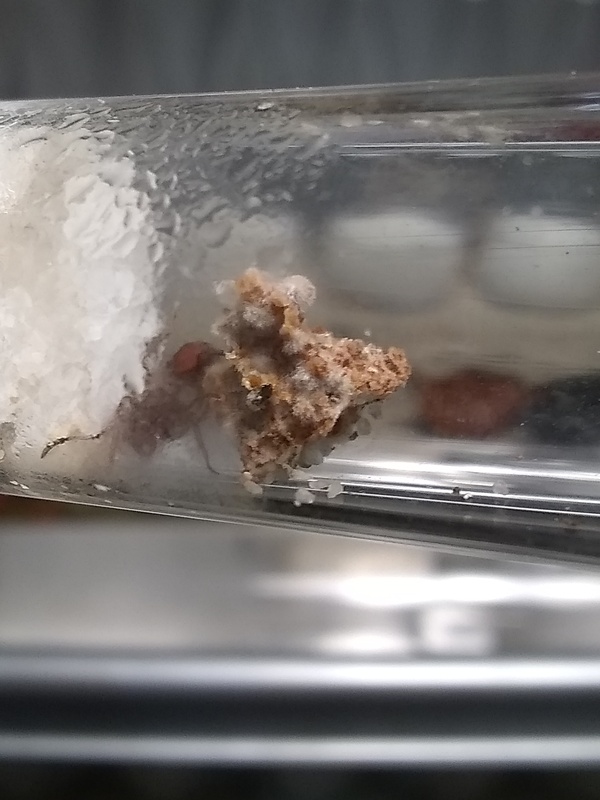 This is the fungus that one queen tore up. As you can see the left half is orange and dried out and dying. The piece on the right has a little bit of white and is barely hanging on to dear life. 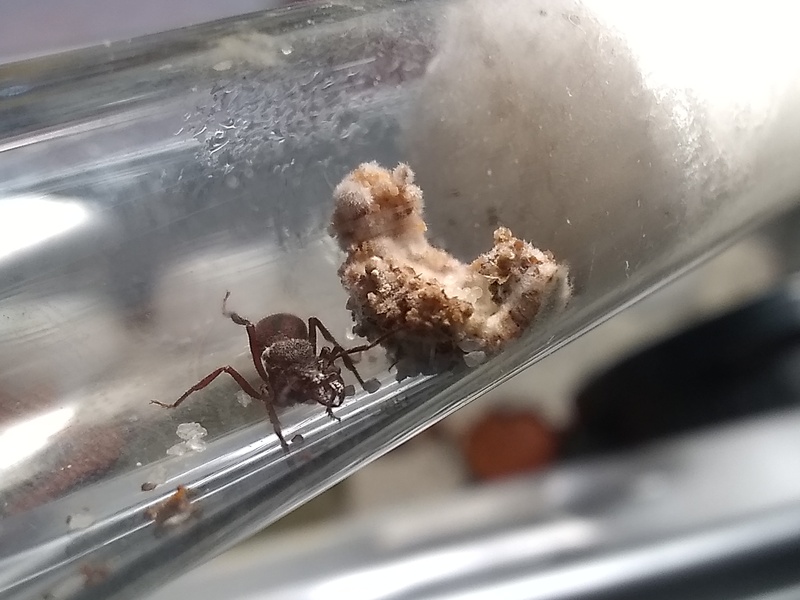 I was so worried thinking she had killed it. 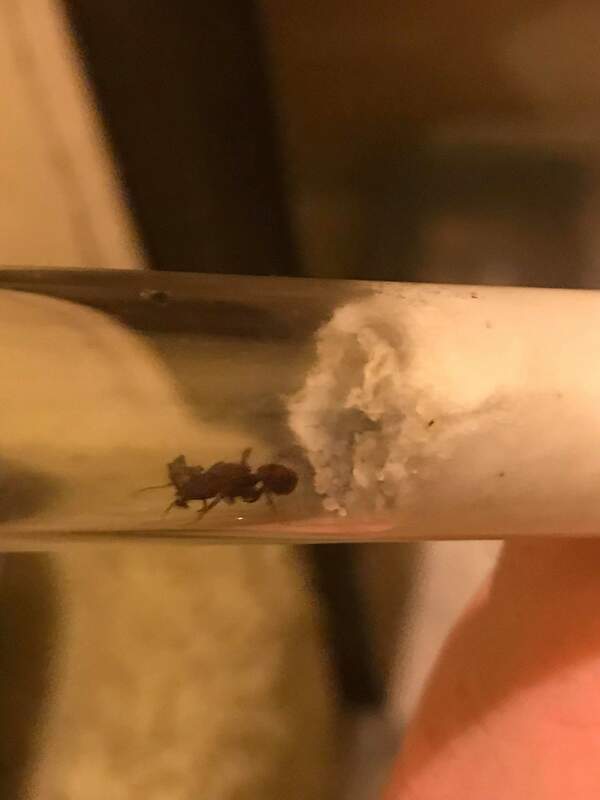 My first Queen. 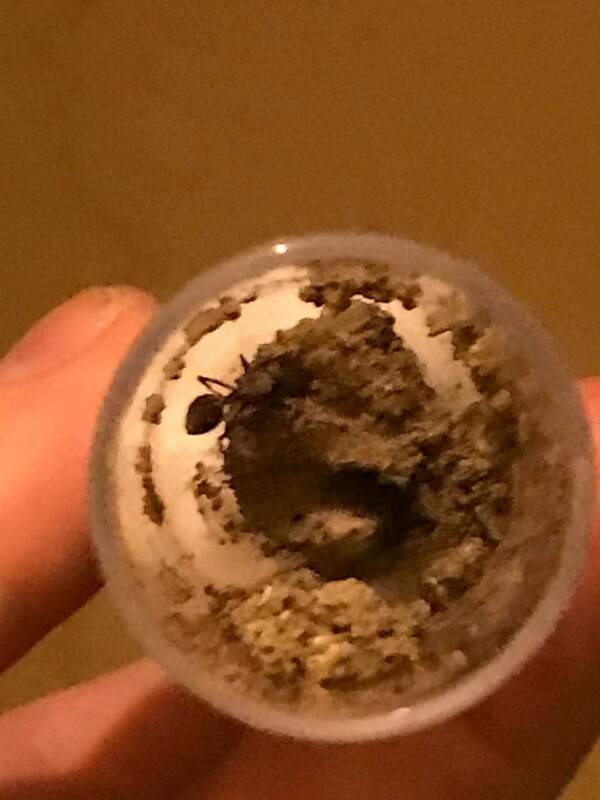 The mud is what I took the homein since I didn't have test tubes at the time and only had snap caps I had to improvise. 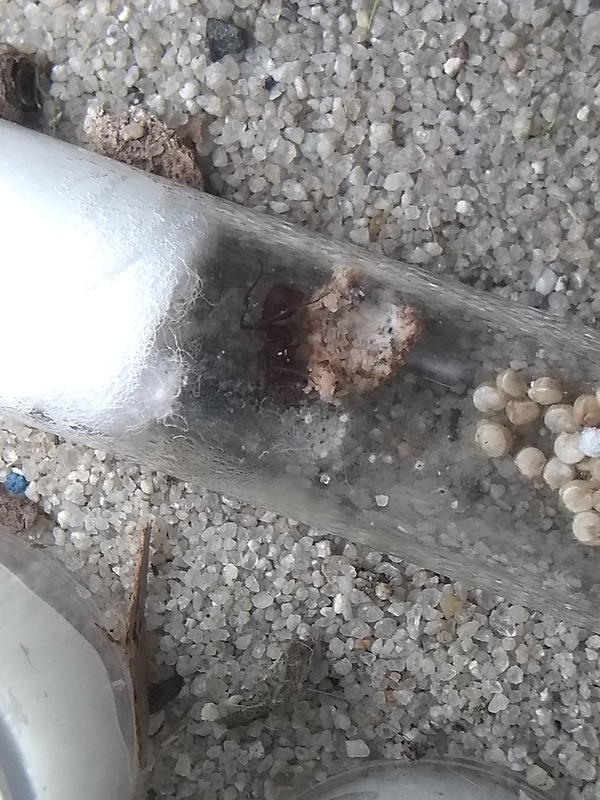 New giant plastic test tubes added with lots of water to really increase the humidity. 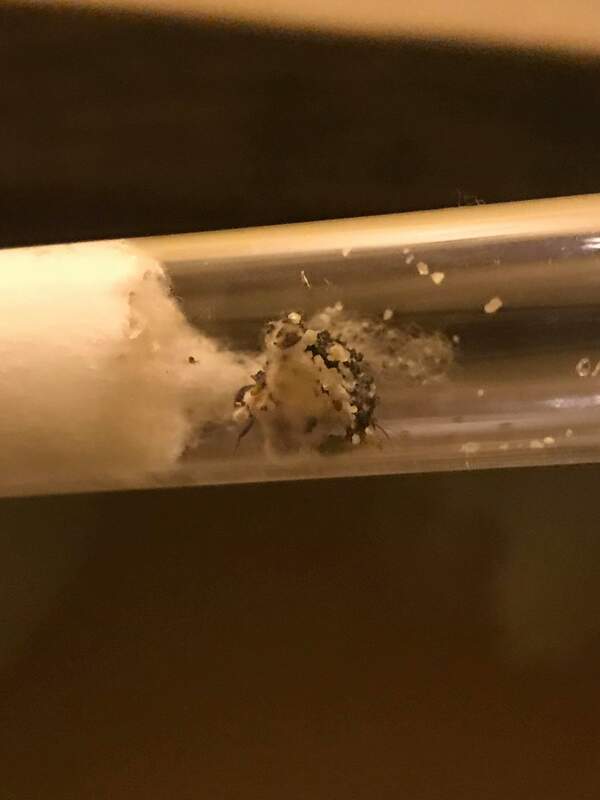 Remember that queen I was worried killed her fungus? 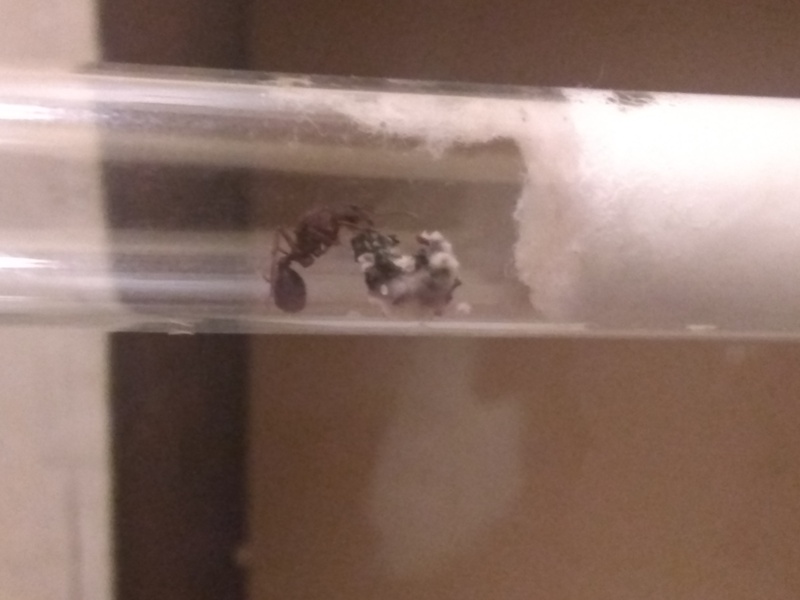 Look what she managed to do! She fixed it. 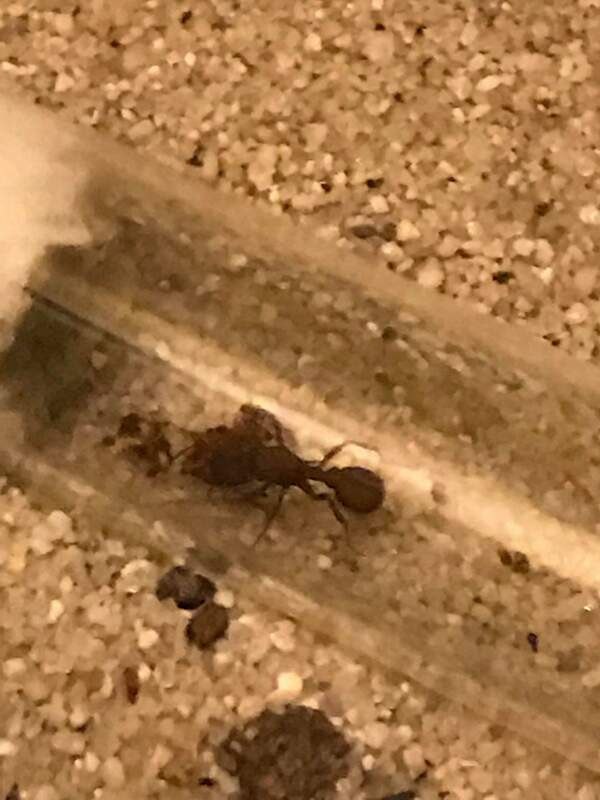 Ants sure are amazing. Update number 5 is very sad. I wanted to try and warm up the set ups since the nights started getting cold. So I used a heating pad made for sore muscles on the lowest setting. 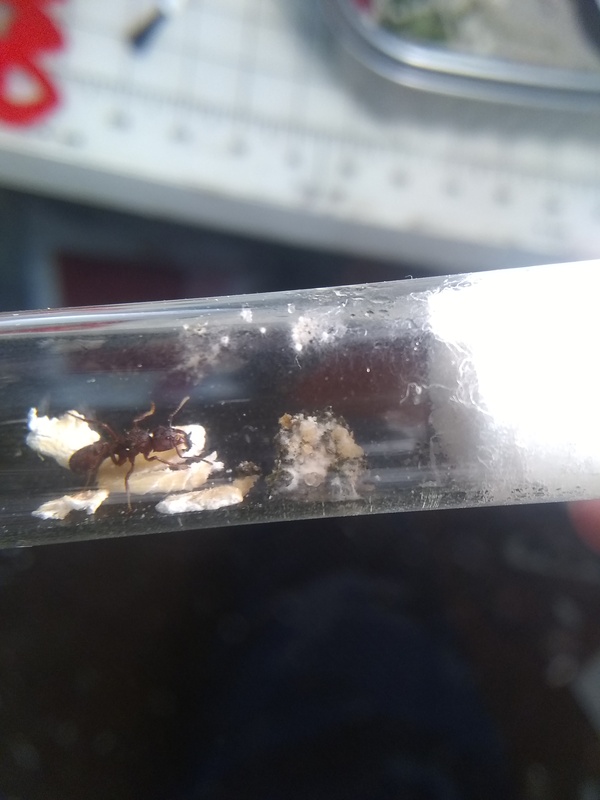 Luckily no ants died but one of the Queens(who was placed directly on the pad) her fungus disappeared. I am still beating myself up over this tragedy. 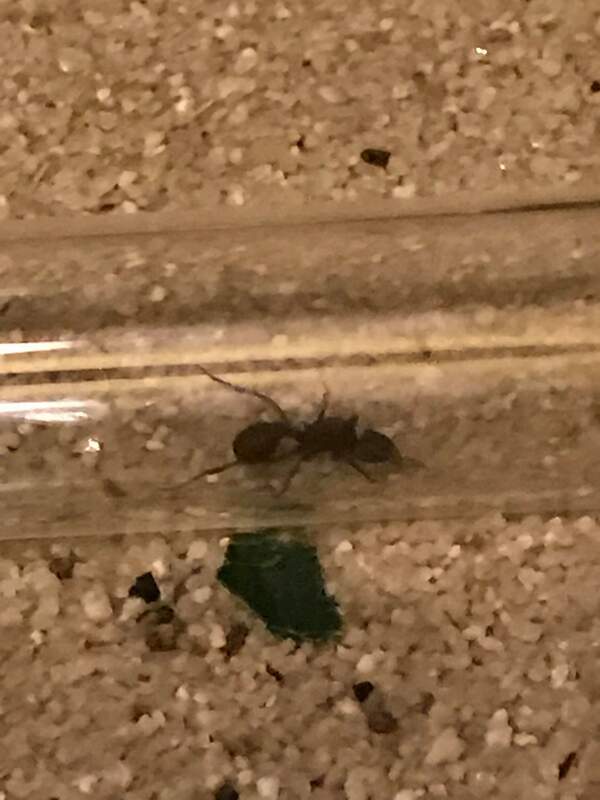 That small black spec was all that remained. 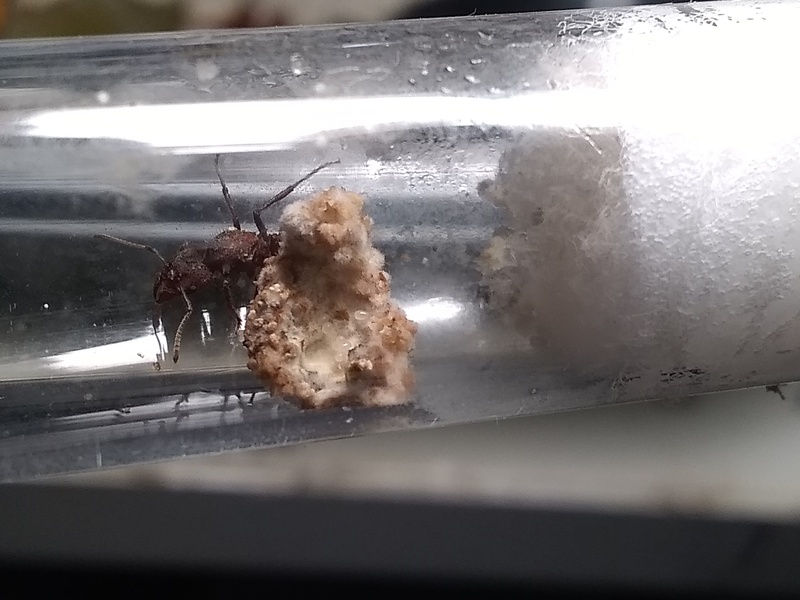 This is the queen that had fixed her fungus and I managed to ruin all her hard work in one night. I have bought reptile heating pads, and have them set up to a timer. I also got some temp/humidity guages to keep track of the temp and humidity levels better. 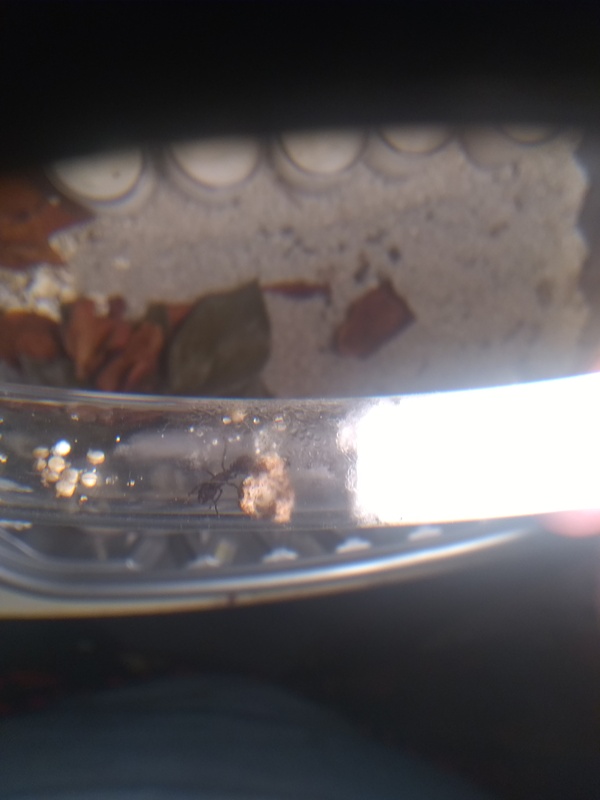 In these pictures you can see I added quinua to the food stock. 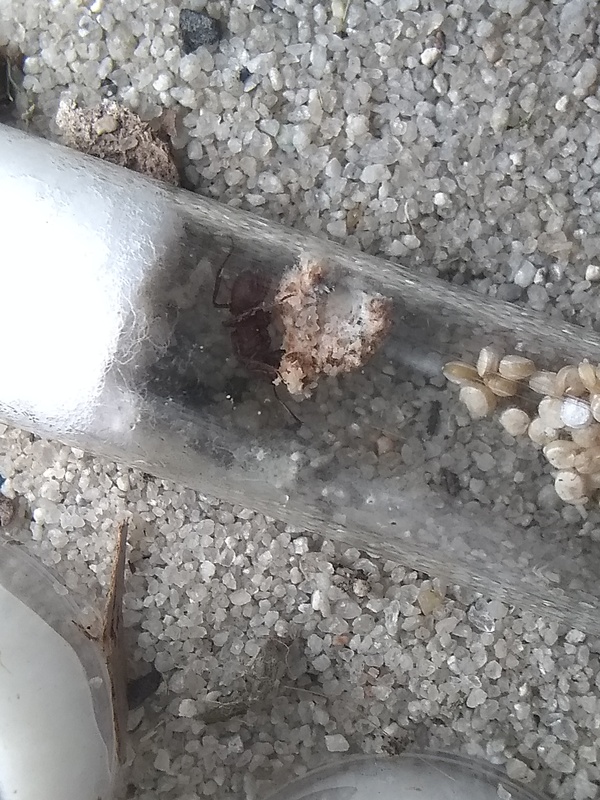 And it looks like the eggs hatched and there are now two larvae, you can kind of see them on the left hand side of the fungus. Good news everyone(any of you ever watch Futurama? 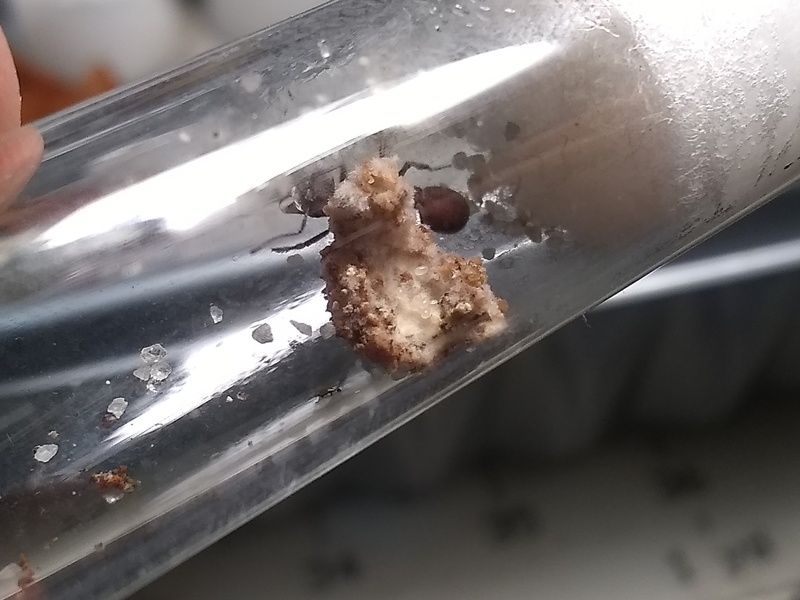 ), The fungus is looking a lot healthier. Most of the orange is covered in white hairs and I even see new white fluff balls. 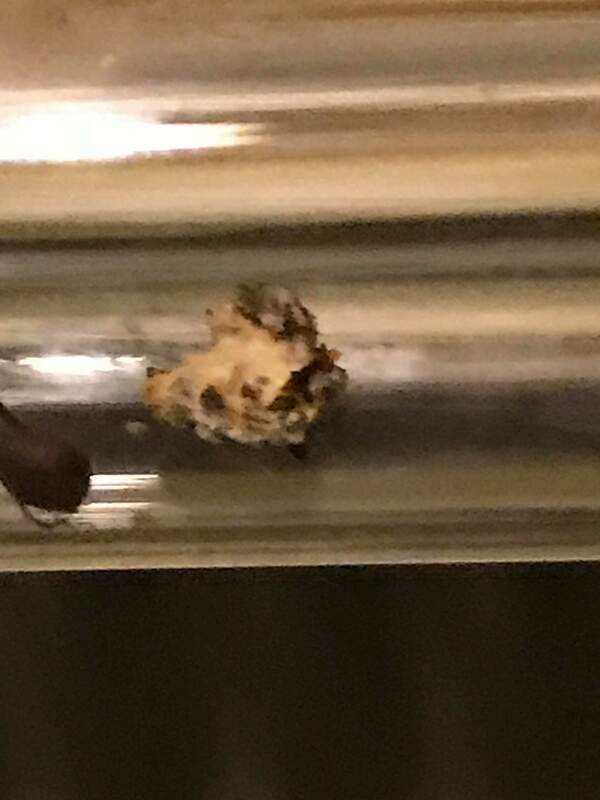 Close up, as you can see the fungus is looking much better. I like big butts and I can not lie. 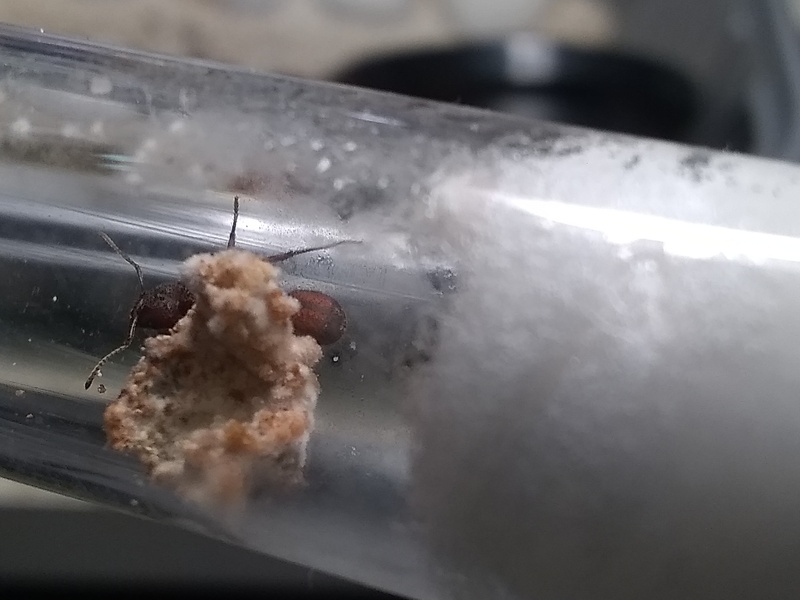 Backend of the fungus. Seriously no matter what position I took the pictures she was there to stare at me. And here is the REALLY good news. 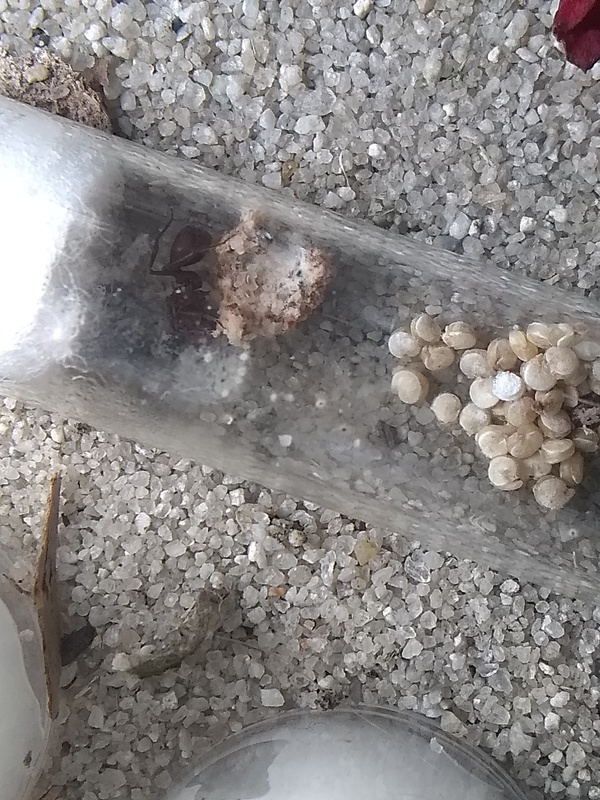 More eggs! I count six! 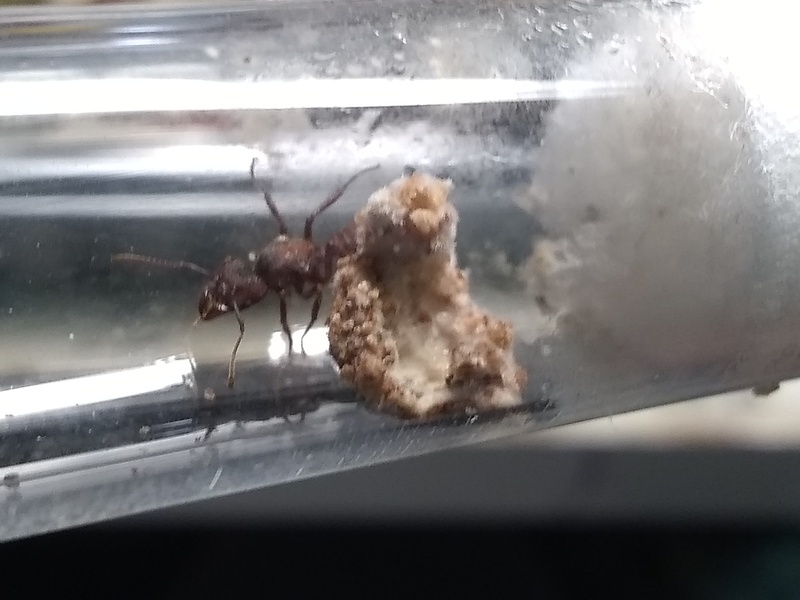 So yeah fungus is looking much better, there's new eggs, and she looks busy and healthy as ever. 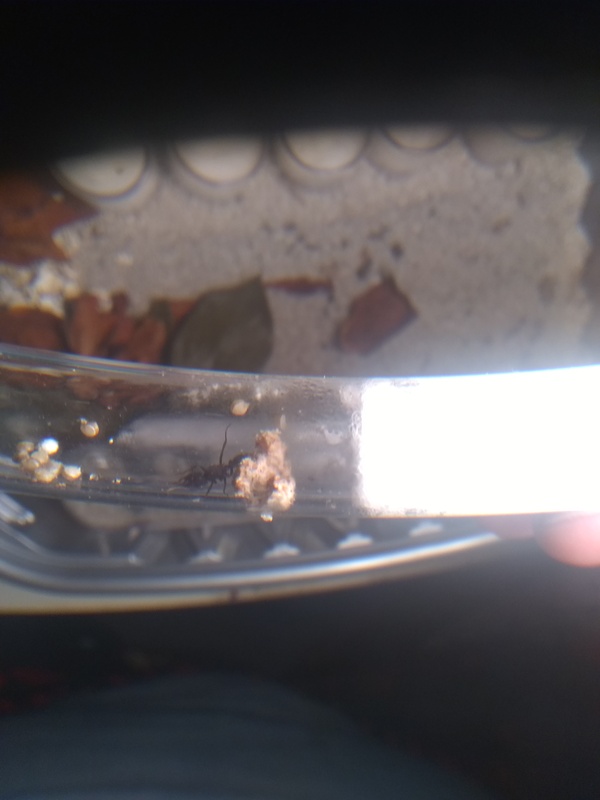 Only issue is now I can't find those two larvae she had anymore. 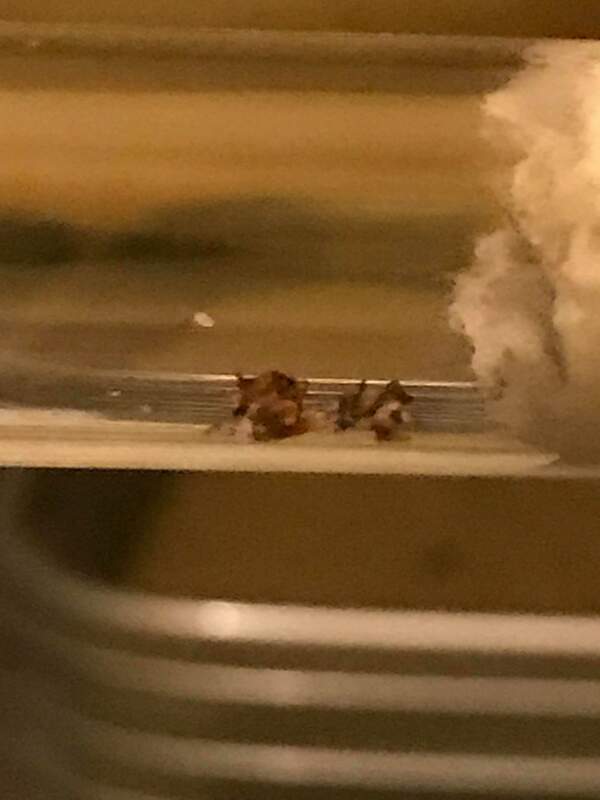 I'm hoping they are just some place on the fungus that I can't see, she liked to move them around a lot.